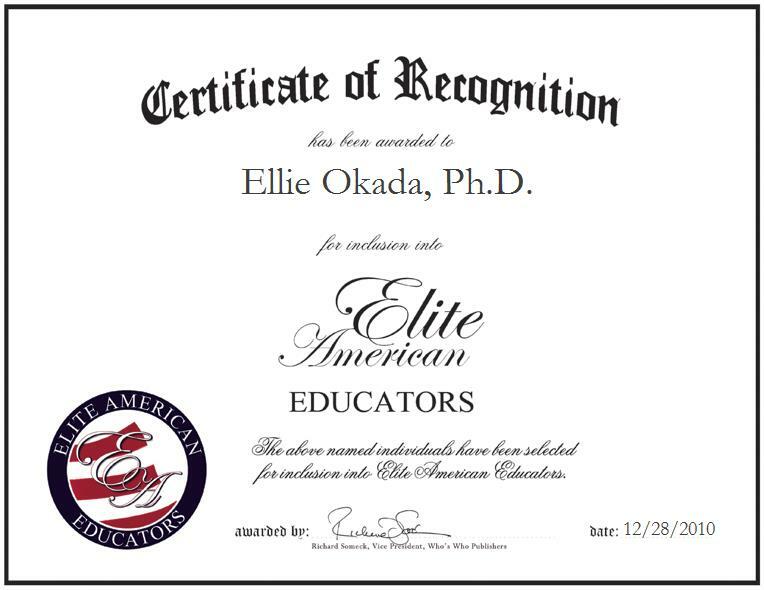 Cambridge, Massachusetts, December 28, 2010, Dr. Ellie Okada, Professor at Yokohama National University, has been recognized by Elite American Educators for dedication, achievements, and leadership in higher education. An expert in corporate growth strategies, Dr. Okada has 22 years of combined professional experience. In her current capacity, she is responsible for teaching Ph.D. and MBA students, and overseeing strategy management on innovative competency and intellectual property management in matured transnational companies. Accrediting her success to her business consulting and contract research experiences, and strategic and analytical skills, she showcases dedication and fluency in all of her daily functions. Dr. Okada was prompted to enter the field of higher education because of her interest in the underlying assumptions on how things work such as research and development policies of the United States and European countries, and her desire to educate the emerging professionals that will one day succeed her. Dr. Okada’s comprehensive background and education has laid the foundation for her copious successes. She holds a Ph.D. in Business Administration from Kobe University in Japan and a Master of Business Administration in the same discipline from the same institution. To coincide with her experience, she is affiliated with the Academy of Management, the Licensing Executives Society, USA and Canada, Inc., the Licensing Executives Society International, and the Academy of International Business. Further, Dr. Okada is recognized as a fellow of the Japan Intellectual Property Association and the Knowledge Management Society of Japan, for which she served as editor and reviewer of the academic journals, involved in planning international workshops in the study of knowledge management and also presented her research outcomes at several international conferences including an international policy conference of OECD. In addition to her eight-year-long tenure with Yokohama National University, Dr. Okada has spent the past years as visiting scholar of Columbia University and an academic associate of Harvard University. Whilst in this capacity, she conducts research with the aspiration of publishing her findings in the United States. To date, Dr. Okada considers her research work with Columbia and Harvard to be the highlight of her career. At the same time, she co-founded an L3C organization in the East Coast of the U.S. as an application of her research. The organization helps women and children who suffer from post trauma stress disorder resulting from violence, such as human trafficking. Likewise, she studies war veterans to develop therapeutic methodologies as a chief scientist. The mission of her research is to help build global harmonization. An award-winning educator, Dr. Okada was honored with a meritorious service award by the Japan Patent Office in 2005. When she is away from her professional duties, Dr. Okada enjoys watching movies, listening to music, and attending concerts. For more information about Dr. Ellie Okada, please visit, http://www.ellie-okada.com.